With 157 miles of shoreline (make that 3,000 miles if you count the shorelines of the Puget Sound and lakes and rivers), Washington state has no shortage of beaches. Ocean beaches along the Pacific Ocean range from wild and without civilization anywhere near them, to mildly developed. Don’t expect anything along the lines of larger California beaches, or even Oregon’s bigger beaches. Meanwhile, beaches on islands along the Puget Sound and even on lakes provide some diversity to the state’s beach scene. But no matter where you go, knowing some of the best beaches to spend time on is the perfect way to bond with the amazing waterfront places within Washington’s bounds. Also, no matter where you go, chances are the water will be cold. Neither the Pacific nor the Puget Sound warms up much all year long, so count on some time on the sand or donning a wetsuit if you choose to take a dip. Ocean Shores is one of Washington’s most popular beaches. Located about three hours from Seattle, the town of Ocean Shores is a bit quieter than similar Oregonian cities, but has the requisite oceanfront hotels, seafood restaurants, places to buy saltwater taffy and family fun. Of course, it also has a beach — several miles of beach, actually. The beaches along the hotel zone allow cars on the sand, so you’ll be able to park right by the surf if you want. Ocean Shores is also the place to go if you want to ride a horse along the beach, and you’ll find bike rentals too. If the hotel zone is not your thing, you can wander farther down the beach and find quiet places, or venture out to the jetty at the far southern end of town to see big waves rolling in as you stand on the rocks. Westport and Ocean Shores are on two opposite sides of one bay from one another. Both have jetties, and Westport also allows cars on the southern part of its beach. Westport is a little less commercial, though, and has fewer hotels. It’s a great spot if what you want to do is enjoy Washington’s beaches for the finest they have to offer — namely deep sea fishing, crabbing, razor clamming, or enjoying nature. Westport is known for a herd of elk that graze nearby, and it’s close to a few cranberry bogs you can drive by and see. Seabrook is a Washington beach town that does things a little differently. You won’t find a strip of hotels here. Instead, the planned community is made up of immaculate rental cottages and homes paired with some well-placed amenities: a Town Hall for things to do, a pool, a park and game courts. Some cottages are right along the water, but most are set back; the beach is never very far away. Go beachcombing, sit in the sand and watch the waves, or find your own adventure. Of all of Washington’s beaches, Seabrook is one of the most picturesque due to its adorable Cape Cod-like town. Long Beach isn’t kidding around about being long. The beach stretches for 28 miles, but of course, most of it isn’t lined by hotels and things to do. Still, if you have a hankering for a really long beach walk, this is the place for you. In the town of Long Beach, you can enjoy walking along a wooden boardwalk, rent a bike or go-kart, take a horseback ride or explore the town. Like most of Washington’s ocean beaches, during the season, you can go crabbing, clamming or fishing. Any time of year (but it’s better in warmer weather), you’ll find any number of other activities from golfing to exploring nearby lighthouses. But, of course, sometimes the best thing to do is just hang out on the beach and bring your kite along and relax. While Washington has a few quintessential beach towns, where the state really excels are wilder beaches that lack amenities and are all nature all the time. Case in point: Ruby Beach in Olympic National Park. Ruby Beach is rocky and rugged and built for exploring. Peep into tide pools and bring your camera along to get the best shot of the giant rock formations. Wear good shoes or sturdy sandals to explore as the beach is rocky. Keep an eye out for the rock cairns visitors tend to leave behind, or build your own to add to the cool atmosphere. 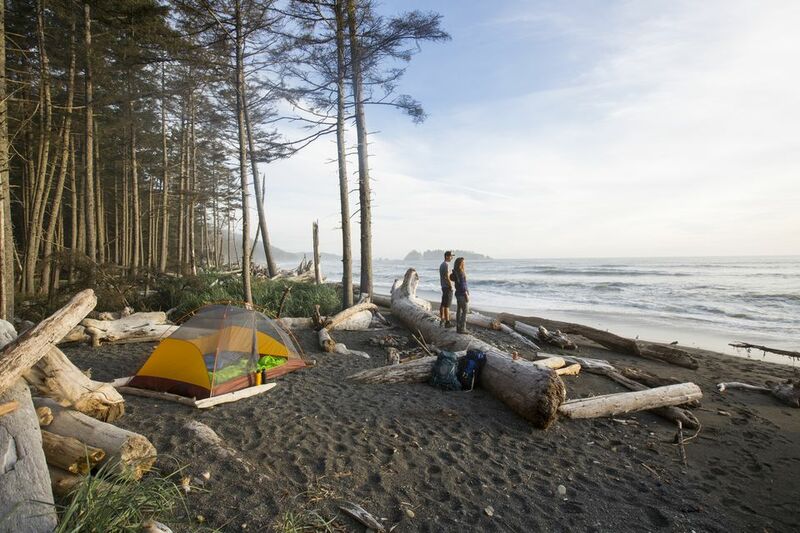 Better yet, pair the beach with a stay at Kalaloch Lodge just 10 minutes south and add in some exploration of the Olympic National Park and other nearby shorelines. If you prefer a quieter beach, you’ll find most of Washington’s Pacific shoreline to be pretty laid back and isolated. Beaches perfect for those who want to stay in a small local lodge or go camping near the shore include Copalis Beach, Moclips, and Pacific Beach. These are also great locations to keep an eye on razor clam digs and other more natural pursuits. Likewise, Olympic National Park is home to not just Ruby Beach, but others as well, including Mora and Rialto Beach and the Lake Ozette area. Don’t expect beach hotels and salt water taffy. Do expect sheer natural beauty. Of course, not all beaches are along the Pacific Ocean. Seattle is home to one of the best urban beaches in the state: Alki Beach. The sandy stretch reaches 2.5 miles so there’s plenty of room for a waterfront walk either on the sand or along the paved path nearby. Just like the ocean beaches, the Puget Sound is pretty chilly at 46 to 56 degrees year round, so swimming is not likely at the top of anyone’s list, but the sandy beach is perfect for a game of volleyball, sunbathing or exploring.